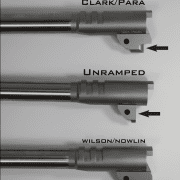 We wanted to post a graphic with the different style 1911 ramps. If you need help in identifying which you have see the picture with all three styles. These are .355 caliber and may look slightly different than your exact barrel if it’s a different caliber but the ramp styles stay the same through all calibers. Note the Clark/Para has a rounded surface under the ramp. The Wilson/Nowlin has a flat surface under the ramp. The Unramped barrels obviously don’t have a ramp and have substantially less material under the chamber. We only make 10mm and .40SW barrels in ramped barrels.